Hello there! Can’t believe it’s September already. Now that summer is almost over I feel a little more like spending more time at the computer. 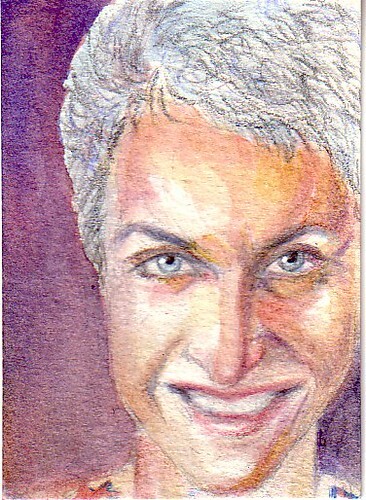 I’ve spent most of August trading a lot of custom portraits on atcsforall.com and illustratedatcs.com. It’s been challenging and fun. Here’s one of the cards that I made for a trade on illustratedatcs.com. I like the way the eyes turned out in this portrait. I’m still not comfortable with watercolor, but it’s not bad. Just a year ago I was so terrified of watercolor. I’m so glad I decided to just get over myself and give it a try. Perhaps I’ll be able to take a class next year, but right now I’m just going with my instincts. I’ll post a few more of these portrait cards next week. Oh, goodness. She is lovely. The fact that this is watercolor amazes me because it doesn’t scan as such. Your portraits are amazing. Whatever the media used! Thanks Pam, you are always so sweet. Thanks for stopping by. Another beautiful portrait! The eyes are terrific, so much expression, and the whole piece is just wonderful! Thanks Ann. Of course now I see all sorts of things wrong with it, but I still think the eyes are the best part. I’m so glad you like the piece! Beautiful portrait, the eyes are sparkling and she has a wonderful smile. The colors are gorgeous. Were you in a portrait swap? I must of missed this one but I always enjoy seeing your beautiful portraits! Hey Rhonda, I just traded a portrait for a card that she had in her gallery. We really need to trade again. But if I remember right we’re both in a moleskine exchange so I’ll get to have some of your lovely art in my new japanese moley. Looking forward to it. Oh thanks Mariana! I really appreciate it.